Manufacturer of a wide range of products which include p p service saddle, pp repairer saddle, pp repair saddle, polypropylene pipe saddle, pp service saddle and pp pipe saddle. 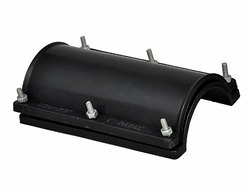 We are manufacturer and supplier of wide range of Polypropylene Service Saddle which is used for repairing the broken pipe or adding a connection joint. 160 mm X 1.1 / 2" ,160 mm X 2" . We feel immensely pleased to offer an exclusive gamut of PP Repairer Saddle to our esteemed clients. The offered repairer saddle is manufactured by making use of high-grade polypropylene plastic material. 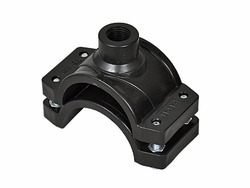 Conforming to the defined quality parameters of the industry, these offered saddles are used to repair HDPE/PP/PVC pipes in irrigation, industries and house service connections. Available to us a wide gamut of PP Repair Saddle. 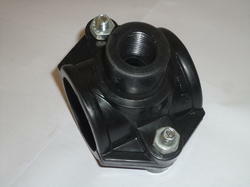 Our range of products is widely used in drip irrigation on and also in domestic application. Supported by experienced professionals, we are offering a beautiful range of Polypropylene Pipe Saddle which is used for repairing the broken pipe or adding a connection joint. 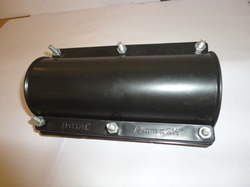 We are Manufacturing a wide range of PP Service Saddle which is used for repairing the broken pipe or adding a connection joint. 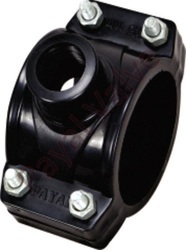 160 mm X 1.1 / 2" ,160 mm X 2"
We are offering PP Pipe Saddle to our client.